The Maui Nui Makai Network has achieved great things since its beginning in 2013 as the first community-based marine conservation network in Maui Nui. Our mission is to connect communities across Maui Nui to care for and restore healthy ecosystems on which Hawai'i's people depend, and the Network is a reminder that each group working hard in their own communities is creating big changes collectively. Our purpose is to share and learn from our diverse experiences, lessons, and best practices to help member sites mālama (care for) specific makai (seaward) areas. Collectively, we have reached over 35,000 people through outreach efforts that share our messages of mālama 'āina. Together we care for over 18 miles of coastal area, often in partnership with other organizations and agencies. To encourage each other to keep up the good work, Network members meet at least two times per year around February and September. ​Learn more about our mission and partnership, highlights in the media, and Helpful Tools developed and utilized by the Network. In 2013, Hōkūle‘a and Hikianalia set sail on the Mālama Honua Worldwide Voyage to highlight diverse global cultural and natural treasures and the importance of working together to protect them. As part of this journey, individuals and organizations throughout Hawai‘i signed the Promise to Pae‘āina, a pledge to increase the health of Hawai‘i’s oceans by the return of the wa‘a (canoe) in 2017. 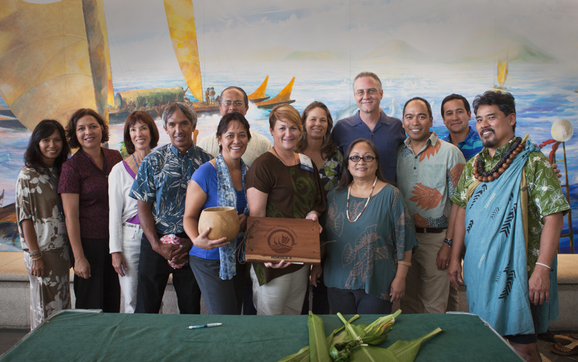 In July 2014, the Maui Nui Makai Network pledged to help protect, restore, and conserve marine resources around Maui Nui through their strong connections to each other and their places.